Lag Ba-Omer is literally the thirty-third day of the Omer, as indicated by the numerical count of the value of the Hebrew letters: “lamed” equals thirty and “gimel” is three, for a total of thirty-three. The Omer period, counted for forty-nine days from the second night of Passover to Shavuot, is traditionally a time of mourning. Although the countdown is ordained in the Bible, the time frame became associated with a tragic period in Jewish history when 24,000 of Rabbi Akiva’s students fell victim to a plague. In commemoration of this catastrophe, mourning practices are observed during the Omer. On the thirty-third day of the Omer none of the students died, and the anniversary of the reprieve is marked by permitting joyous practices which are prohibited during the rest of the Omer, such as getting haircuts, shaving, listening to music, and celebrating weddings. 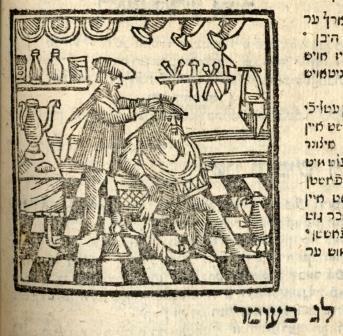 This woodcut illustrates a man having his hair cut. It is from a Minhagim book, a compilation of Jewish customs and practices, published in Amsterdam in 1723. The book was originally written by Isaac Tyrnau of Vienna at the end of the fourteenth century and was first published in Venice in 1566. 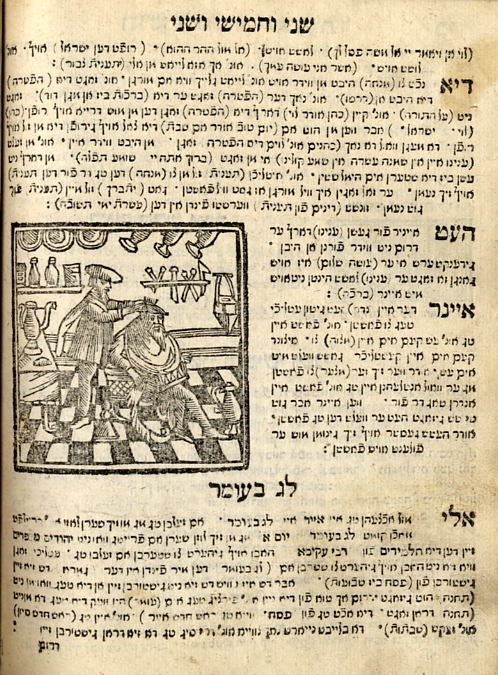 The 1723 edition with woodcuts was published by Hirts Levi Rofe and Yitshak di Kordovah in Amsterdam.